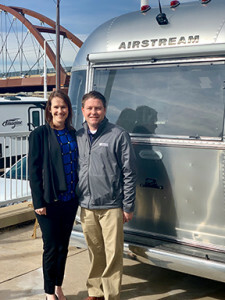 Lakewood, CO – March 21, 2019 – Windish RV Center, Colorado’s #1 towable dealership, announced today several leadership changes that reinforce a new generation of leaders and strengthen the Windish family legacy. Under president and owner Carolyn Windish Irwin, Windish RV has solidified itself as a leader in the industry and expanded to three locations in Colorado. Focusing on the future, Windish RV is thrilled to announce Corey Shaw has been promoted to General Manager and Whitney Holtz has joined the organization as Vice President of Operations. Corey Shaw has 16 years of experience in the RV industry. Corey joined the Windish sales team in 2006 and was the Sales Manager at the Lakewood location before his promotion to General Manager. In his new role as General Manager, Corey will oversee operations across all three Windish RV locations. Corey is a native of Colorado, an avid camper and holds a bachelor’s degree in Marketing from University of Wyoming. As Vice President of Operations, Whitney Holtz, will oversee day-to-day operations to support the continued growth of Windish RV. Whitney is a Colorado native and the granddaughter of Dale Windish, founder of Windish RV. Before joining Windish RV she worked in marketing and communications strategy for TTEC, a global leader in customer experience technology and services. Whitney began her career in consulting valuing the media rights of sports franchises and media properties before moving to Chicago to manage ticket operations for the Chicago Cubs. She holds a bachelor’s degree in Business from Trinity University and an M.B.A. in Finance and Marketing from the University of Denver. Windish RV, is a family owned and operated dealership with three locations in Colorado. Carolyn Windish Irwin assumed the role of president and owner in 1995 after her father and Windish RV founder, Dale Windish passed away. Since then, Carolyn has grown Windish RV to three locations, opening the Longmont store in 2009 and then the Colorado Springs store in 2017. Windish RV prides itself on being a family business and keeping family at the center of everything they do. As an active member of the Colorado community, Windish RV is proud to support several local groups including Denver Urban Scholars, Sense of Security and The Action Center.